Mt. Blackburn and Willow Lake, Wrangell St. Elias National Park, Alaska. Alpen glow and fall color bring this scene alive. Mt. 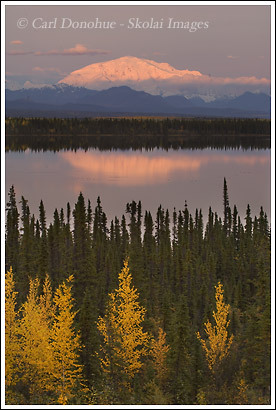 Blackburn towers over the Wrangell mountains, and it’s reflection in a perfectly calm Willow Lake, with some fall color on the spruce trees, make for an awesome view.